The Weather at the Cedar Hill Lodge: 8100 ft.
All around the year one needs a minimum of two-layered clothing (cardigan & a light jacket/ shawl) as the weather at this altitude is unpredictable which adds the flavour of the environment at such an altitude. Also, Cedar Hill is situated on a hilltop with wide open views and this in part brings the winds from the Himalayas on a regular basis. 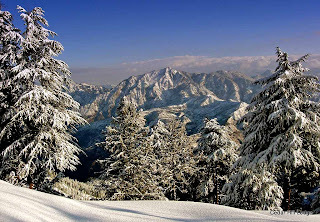 Snowfall at Cedar Hill - View of Shali Tibba peak, Temple. Winters: (Dec.–Feb. ): A striking view of the round-the-year snow bound Himalayas mixed with the cool winds and these arty clouds in the blue horizon wrap around the enchanting landscape which perpetually keep Chharabra under the spell of the sun or the moon. 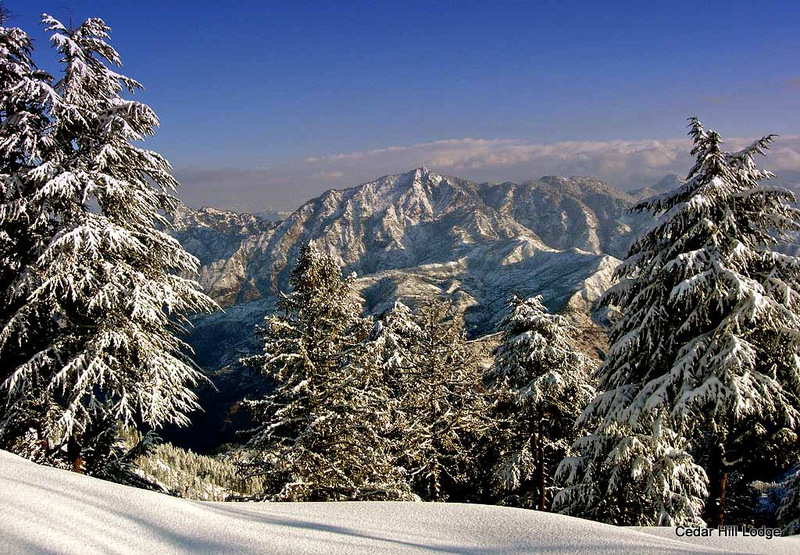 It is the time of snow, thick jackets, and hot drinks – for the wild animals this is time to come down from the higher altitudes and make the forest sanctuary and the village surroundings their home. Life is at a peaceful sluggish pace as expected of a village and bonfires, happy faces and folklore amongst the locals are their favourite way to enjoy the evenings. Summers: (Apr.–Jun. ): The summers are heavenly with cool gentle winds, and even though Shimla is only 12 Kms. away from the lodge, the 1000 ft. difference in altitude leads to peace, tranquility and beauty – but it also brings with it a certain moody temperament of Mother Nature. The Himalayas for most times are enveloped by thick clouds that boil this rugged landscape but it is a perfect time to explore, hike, travel the landscape - relaxing the mind body and soul from the pace of the cities. The good part: Chharabra is alive during the day but the arrival of dusk brings the village back into its elements. An ideal way to spend ones vacation exploring, savoring the modern comforts of the Shimla town and to end the evenings peacefully relaxing at the lodge. Monsoons: (July – Mid. Sept.): This is the time when the Himalayan flora is at its finest with a host of wild flowers blooming on every hillside. The clouds play a dance of design, and the rains open up the occasional line of sight into the Himalayas. This would be the time when we call the clouds ‘Pixel Clouds’ as the colours in the horizon are infinite. Autumn/Fall-Winter: (Oct. – Dec.): These times bring Chharabra, the countryside to a standstill. Business, life, the people are relaxed and are preparing to enjoy the winters. The landscape feels like a portrait where the pictures taken seem unreal. And again: an ideal time to enjoy the sun, the tranquil environment and a time to savor the elements as they gear up for the incoming winters.